This is a rhetorical experiment that we’re growing tired of running, but it’s just so valuable when it comes to proving a point about the media’s bias. Just imagine a world in which Valerie Jarrett or some other top Obama aide was shaken, assaulted, and screamed at by a crazed Tea Partier at a restaurant in, say, 2013 or thereabouts. The media would go absolutely ballistic. There would not be one word – not one SYLLABLE – about how Jarrett somehow deserved it for working for such a divisive president. There would not be one word of blame for Obama. There would only be shame, condemnation, and inevitable cries of racism from the media. It would be loud and it would be constant. Hell, when Roseanne merely pointed out that Jarrett bore a striking resemblance to a Planet of the Apes character, the world nearly exploded. Imagine if she had screamed at her in a public place! But in this world, where it is Trump aides and Republicans getting screamed at by damn dirty liberals, the media thinks it’s just fine to stick up for them, blame Trump for dividing the nation, and generally insinuate that, well, you get what you deserve when you hang around the likes of this president. And that’s when they even talk about these incidents at all. We were stunned to listen to Kellyanne Conway on CNN, describing her run-in with one of these lunatics – not because it happened but because we don’t remember hearing a thing about this incident at the time. 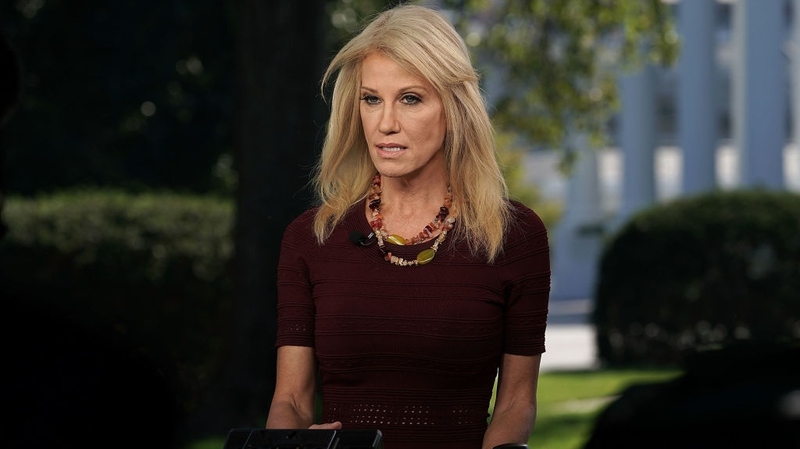 Conway says that late last year, she was at a Maryland restaurant called Uncle Julio’s when a 63-year-old moronic woman approached her from behind for a confrontation. Apparently the woman in question, Mary Elizabeth Inabinett, is up on charges of second-degree assault and disorderly conduct. CNN’s response to Conway’s story? Well, naturally, they asked her if Trump was not in fact to blame – what with all of his divisive rhetoric. “You violated my challenge, which is to try to form a sentence, let alone a paragraph, and not mention Donald Trump. Nobody seems capable of doing it. It seems like it’s a physiological impediment for the world,” Conway said. Well, it is certainly one suffered by the Democratic Justice Warriors over at CNN. Hopefully, the courts make an example out of Ms. Inabinett. It’s about time for Maxine’s Army to get a legal wake-up call.